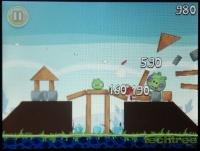 Great sound quality; Support for DivX; Comes preloaded with Angry Birds. Mediocre build quality; Resistive touch screen; Fixed display brightness; Lacklustre camera performance. We were impressed with the Asha 200. Needless to say, our expectations from its sibling, the Asha 300, are pretty high too. This bar-shaped handset is special due to its 1 GHz CPU and it comes pre-loaded with the Angry Birds game. 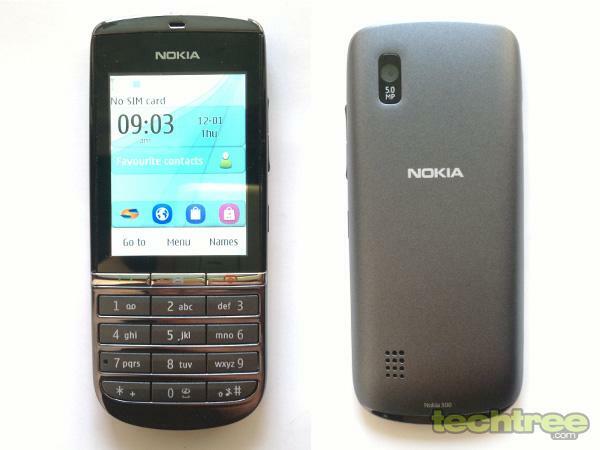 The video review for Nokia Asha 300 is given below. The retail pack ships with the phone, charger, and earphones. The device measures 4.4" (l) x 2" (w) x 0.5" (d), and weighs 85 grammes. Nokia is known for excellent build quality and decent looks. 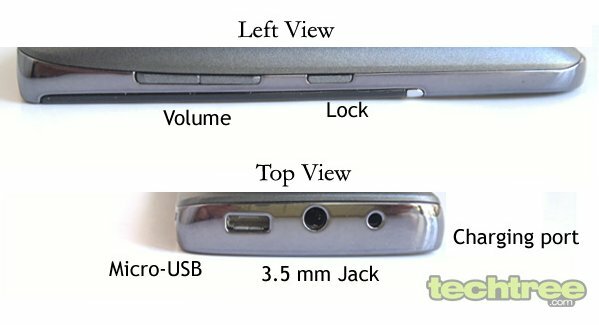 However, the Asha 300 is an exception, due to the tacky chrome finish and questionable quality of plastic components used. What's worse, is that the handset makes a creaking sound when pressed. The handset's 2.4" screen has pixel dimensions of 320x240. The display is bright and its colour reproduction is also good. However, there's no option to increase or reduce brightness. Additionally, the viewing angles aren't that good. The Asha 300 is powered by a 1 GHz CPU, and has 128 MB of RAM. It comes with a 5 MP fixed focus camera, charger plug, micro-USB port, microSD card slot supporting upto 32 GB of memory, 3G support, 3.5 mm jack, 1110 mAh battery. What's sorely missing is the Wi-Fi connectivity. Although it's not found in most feature phones, it's not wrong to expect this functionality at a price tag well aboved Rs 6000. On the software front, the handset features a touch-friendly version of the Series 40 OS. 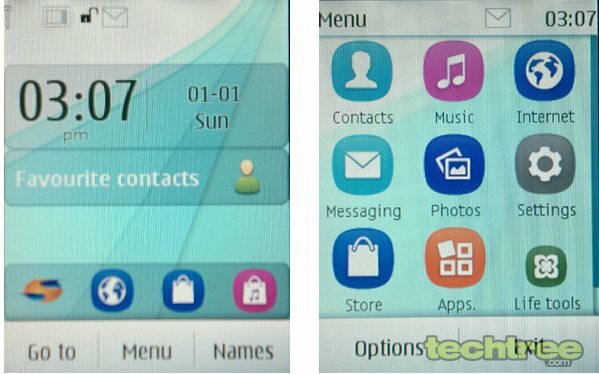 It features prominent icons resembling Symbian 3. As usual, the interface is pretty simple. It lets you set shortcuts for your favourite apps right on the Homescreen. Additionally, you can customise the Menu view, and set a theme of your choice. However, the UI is far from pleasing. Despite the 1 GHz CPU, the device doesn't seem to be snappy. The resistive screen is better than Samsung's Champ series of phones, but it's still an annoyance. I wish Nokia had given a D-Pad rather than a touch screen. 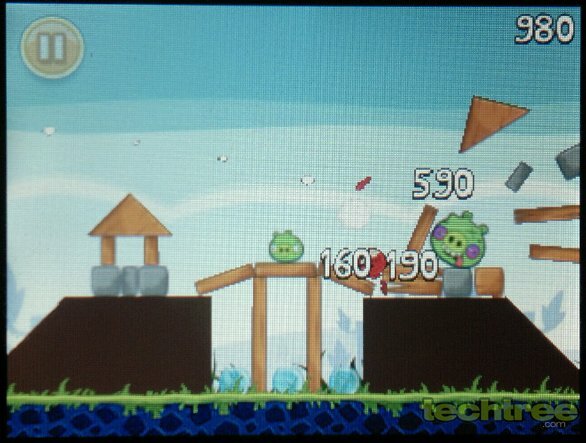 The USP of the device is undoubtedly the Angry Birds game. Thankfully, the Java version of this popular game is playable but then it's not really enjoyable. The resistive screen has its limitations, and you have to use your fingernails to make it work. The mobile has built-in social networking apps for Facebook and Twitter. The onboard Nokia browser is good enough for basic browsing and also helps you save data with its server-sided compression technique. The phone's network reception and call quality were excellent during the tests. Coming to messaging, the keypad isn't that good, but still better than software keyboards. Like the recently reviewed Asha 200, this phone has a decent music player that supports MP3, WMA, WAV, and AAC. Moving on to the sound quality, it's damn good at this price point. 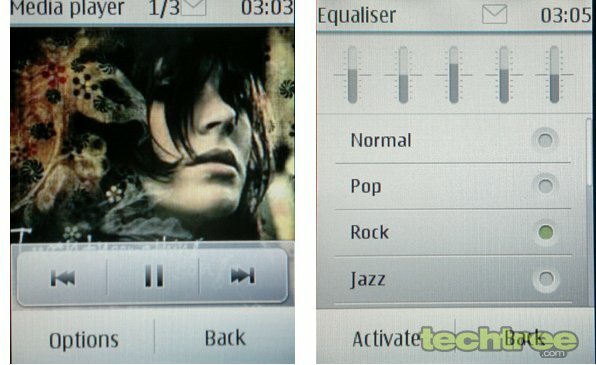 Additionally, Nokia hasn't forgotten to include the equaliser settings and FM radio. The video player supports 3GP and MP4 videos. Surprisingly, it can also handle DivX files with low bit-rate. The onboard 5 MP, fixed focus camera produces good images in daylight photography. However, like most fixed focus snappers, it contains a lot of noise in low light shots. In simple words, the 5 MP camera in Asha 300 is just a marketing gimmick. Coming to video recording, the recorded clips are saved in the 3GP format. At 15 fps the playback is choppy most of the times. With 1 GHz CPU onboard, Nokia should have at least added 20 fps support. The gadget's 1110 mAh battery is can keep the device up for around two day, which isn't bad for a phone with 1 GHz CPU and a touchscreen. The Asha 300 does have a 1 GHz CPU, but its potential hasn't been exploited wisely. The Angry Birds experience isn't good enough to sell this device. Priced at around Rs 6200, the handset isn't a good deal since you can easily get an entry-level Android handset at this price point. If the Finns want to take on cheap Android phones, it should slap Symbian OS on every affordable handset that crosses the Rs 6000 mark. Finally, I'd advice you all to stay clear of this mobile phone. If you prefer touch screen handsets, go for the Samsung GALAXY Y at the premium of thousand bucks.